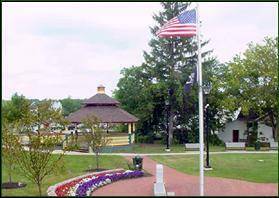 Webster Memorial Park is a park located on Route 250 just north of Ridge Road, East in Webster Village containing a Veterans Memorial, Village Clock, as well as a Gazebo and lawn seating area for summer concerts. The park is operated by the Village Parks program. See the Village Website Home Page for summer concert information during the summer season. Bring a blanket, a folding chair and some goodies to share. Local groups sing and play for the audience while the open area down front is a favorite place for the kids to dance and tumble to the music.